Mark the change of seasons with a drive along the Eastern Sierra, where U.S. 395 threads a colorful path through vibrant autumn scenery. The 230-mile roadway through Inyo and Mono counties is flanked by stands of aspen, cottonwood, and willow trees in hues of gold, orange, and red until the end of October. Designated a state scenic highway, the route passes along the charming cities of Bishop, Crowley Lake, Mammoth Lakes, and Bridgeport, and the eastern side of Yosemite National Park. Pack your binoculars and be prepared for challenging mountain trails to reach some breathtaking views. 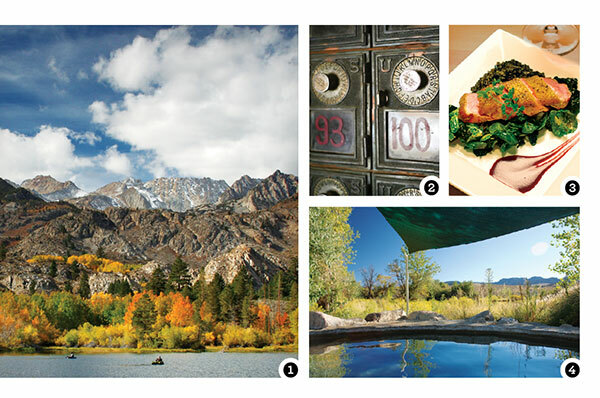 Drive U.S. 395 for the scenery, or navigate from Bishop for rewarding side trips. Head west on California 168 up Bishop Creek Canyon toward Lake Sabrina (elev. 9,128 feet) and you’ll be in Buttermilk country, a spot for bouldering, hiking, and picture-taking named for former sheepherders. Northeast of Bishop on U.S. 6, the Laws Railroad Museum is an 11-acre slice of the Old West, created from original and relocated historical Owens Valley buildings (admission by donation). In Bishop, the late nature photographer Galen Rowell’s Mountain Light Gallery exhibits his prints as well as those of others in the Monument Bank building. it’s a tradition among campers and carbo-loaders to stock up on deli sandwiches and a dream array of baked goods: more than 40 kinds of breads—olive, raisin, and multigrain, to name a few—pastries, candies, cakes, and signature Cheeze Breads ($1.15 and up). Carnivores turn to Bishop’s Mahogany Smoked Meats for jerky—beef, turkey, elk, buffalo, fish, and wild boar. Three magic words: Mahogany smoked bacon ($9 and up). Head to Mammoth Lakes to Petra’s Bistro ($9 to $34), where you can pair wines by the glass with crab cakes, or a hearty pan-seared duck breast. Benton Hot Springs ($109 to $300) where hot mineral water fills tubs ($40 and up) that can be rented by the hour, day, or with lodging.